When you receive the above error, you can find the cause of the error message. You can find the root cause easily with Configuration Manager. For this, start the SQL Server from the Windows Services applet. This error message is an indication that you are in big trouble, but anyhow it needs to be fixed if you want to work on SQL Server. As stated in the error message, reinstall the application but re-installing the SQL Server may or may not solve the problem. It might lead to your database corruption or damage. The MDF files may corrupt as the installation of SQL Server has been damaged. This is the condition when you need SQL repair software to repair corrupt SQL database. There may be some permission problems, so correct it. If this does not work, then uninstall the SQL Server so that all the SQL entries can be successfully removed from the registry. Now install the application again. After installation, all the related problems of installation will get clear. Databases corruption issues are not that easy to resolve but could be with an efficient SQL Recovery software. 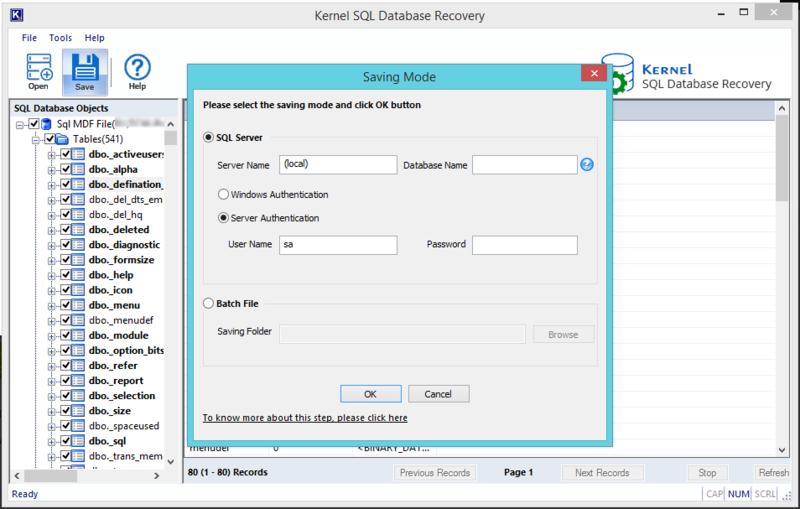 Kernel for SQL Database Recovery software is equipped with advanced repair engine that instantly reacts and fixes corrupt SQL database MDF files. 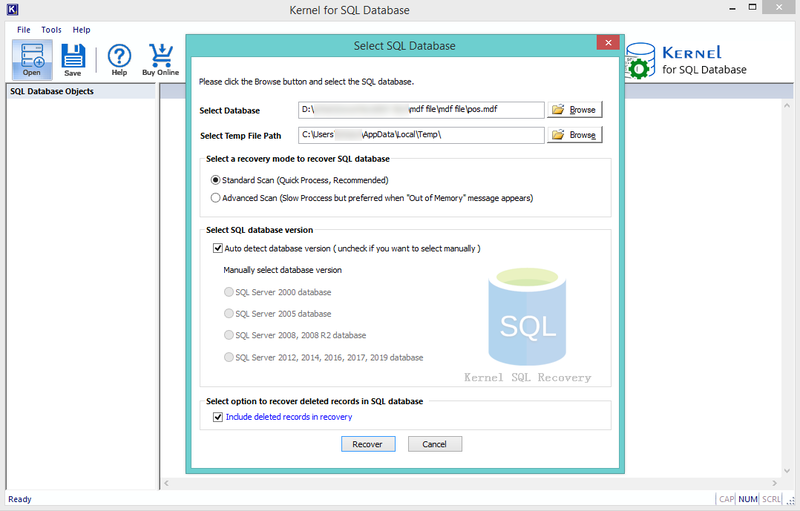 Start Kernel for SQL Database Recovery software and click the Browse button to select corrupt database file, select recovery mode and SQL database version as shown in the screenshot below. You can view and analyze the recovered database objects from the corrupt SQL MDF file before saving the objects to the desired location. Select the saving mode and click OK to proceed. The database file will be saved successfully. 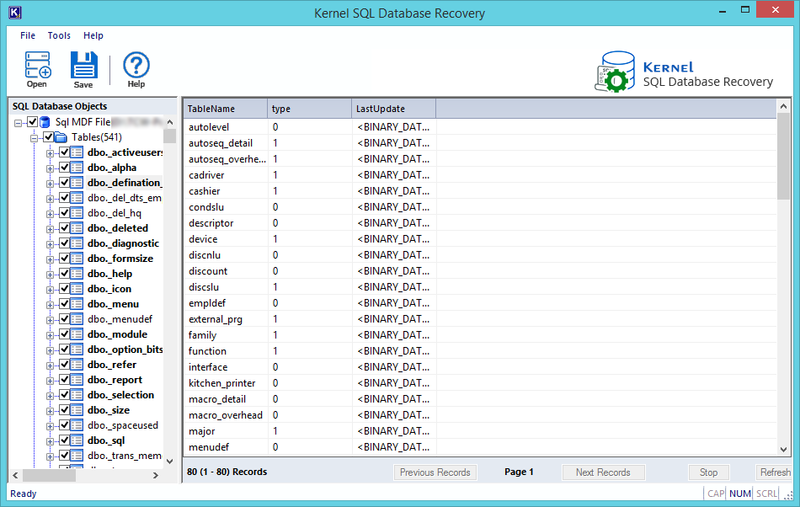 You can also download the free trial version and experience the working, features, and functions of the SQL database recovery software. If you have any queries, you can mention them in the comments section below without any hitch and our support team is always available to resolve your issues for sure.